While I have always had high esteem for Christopher Columbus, he seems to be increasingly criticized into today’s world. I hear reports that kids growing up today are told in school that he was a horrible man. Not fully understanding these criticisms, I recently undertook to studying about his life and accomplishments, including reading a new biography on Columbus called “Christopher Columbus: A Man among Gentiles” written by an LDS author, Clark B. Hinckley. 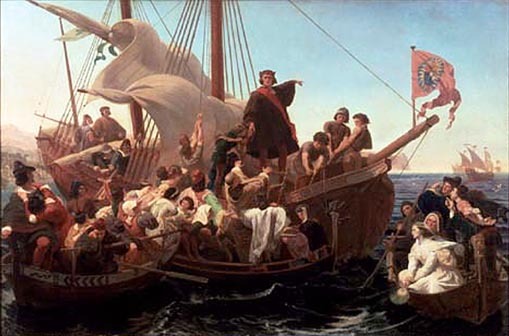 While I have titled this post “Mormons’ View of Christopher Columbus” it might be better titled “This Mormon’s View of Christopher Columbus.” Please be aware that my writings are my own and do not necessarily reflect the views of the Mormon Church, The Church of Jesus Christ of Latter-day Saints. What the Prophets have Taught about Christopher ColumbusThis PowerPoint presentation was given at the LDS Institute of Religion on Nov 3, 2017. While it is interesting to note is that Christopher Columbus was among these “eminent men,” for Latter-day Saints, this is no surprise given the mention of him in the Book of Mormon. Mormons believe that Christopher Columbus is mentioned, though not by name, in the Book of Mormon when the ancient American prophet Nephi sees in vision the discovery and colonizing of America. “And I looked and beheld a man among the Gentiles, who was separated from the seed of my brethren by the many waters; and I beheld the Spirit of God, that it came down and wrought upon the man; and he went forth upon the many waters, even unto the seed of my brethren, who were in the promised land” (1 Nephi 13:12). Elder Mark E. Petersen, another apostle of the Quorum of the Twelve, also confirmed that that man among the Gentiles is Columbus. When Columbus went to King Ferdinand, he said, “I came to Your Majesty as the emissary of the Holy Ghost.” When he stood before the clergy of San Esteban, he insisted to them that he must be regarded as a man inspired. Columbus’s own son, Fernando, in a biography of his father, quotes the discoverer as saying on one occasion, “God gave me the faith and afterward the courage so that I was quite willing to undertake the journey.” And the last will and testament of Christopher Columbus includes this expression: “In the name of the Most Holy Trinity, who inspired me with the idea and afterward made perfectly clear to me that I could navigate and go to the Indies from Spain by traversing the ocean westward” (Wasserman, Columbus, pp. 46, 61). Columbus was inspired, and Nephi looked upon him and beheld him coming to the Western Hemisphere” (Elder Mark E. Petersen – The Great Prologue, BYU Speeches, Sep. 29, 1974). “In my private commemoration of this event, I have read and reread one important and prophetic verse from the Book of Mormon [1 Ne. 13:12], and also a very long biography of Christopher Columbus. …We interpret that [verse] to refer to Columbus. 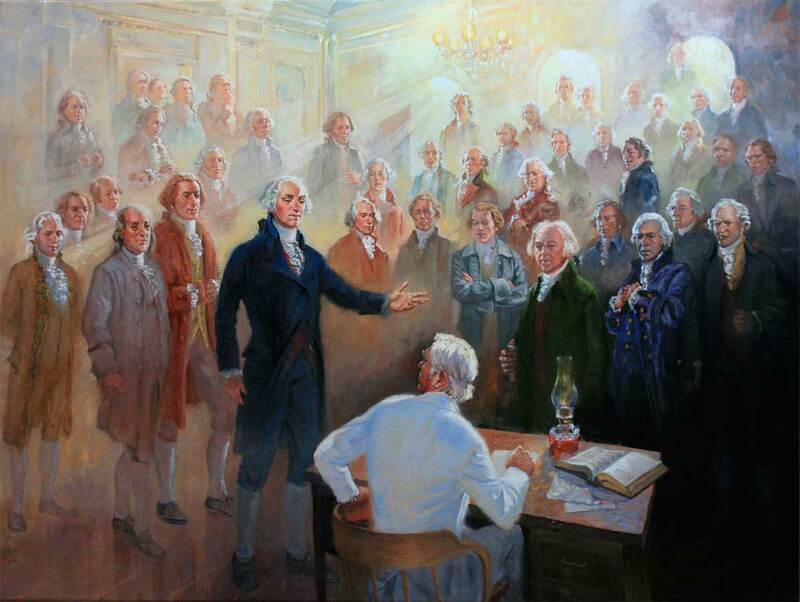 It is interesting to note that the Spirit of God wrought upon him. After reading that long biography, a Pulitzer winner of forty years ago, titled Admiral of the Ocean Sea—I have no doubt that Christopher Columbus was a man of faith, as well as a man of indomitable determination” (Building Your Tabernacle – Gordon B. Hinckley – October 1992). 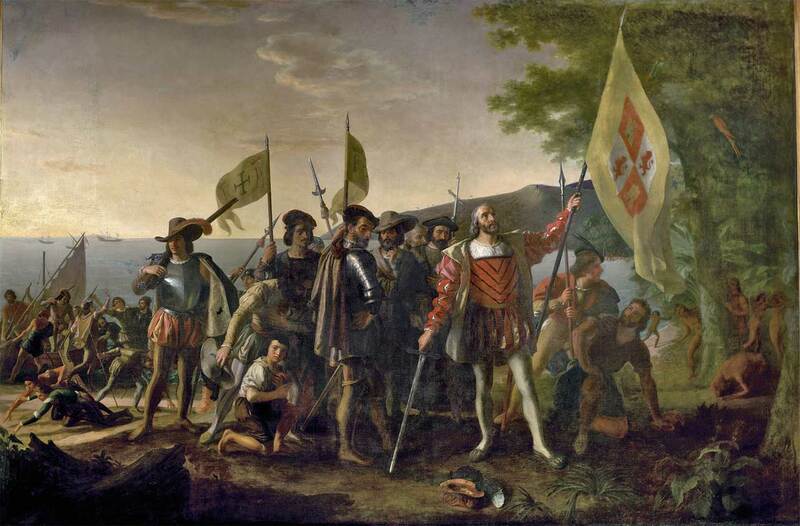 President Ezra Taft Benson, 13th president of the Church, said that not only was Christopher Columbus among the eminent men who appeared to Wilford Woodruff, but Columbus was one of only four men ever known to be vicariously ordained to the Melchizedek Priesthood office of High Priest. 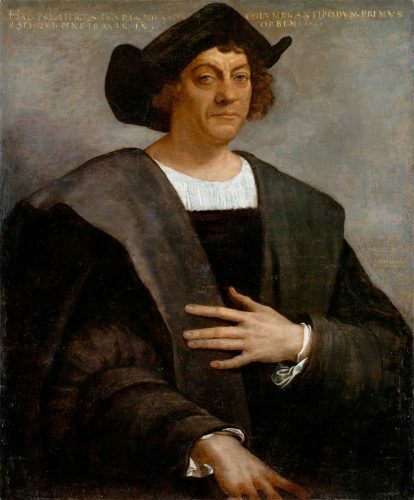 Columbus further stated about the years he spent getting approval and financing to make the voyage across the Atlantic: “I spent seven years here in your royal court discussing this subject with the leading persons in all the learned arts, and their conclusion was that all was in vain. That was the end, and they gave it up. But afterwards it all turned out just as our redeemer Jesus Christ had said, and as he had spoken earlier by the mouth of his holy prophets” (West and Kling, Libro, 107). Orson Hyde said that the Book of Mormon prophet Moroni “calmed the troubled elements” during Columbus’ voyage, he might well have been referring to those events of October 9-10, 1492. Orson Hyde was called as one of the original members of the Twelve Apostles by the Prophet Joseph Smith in the early days of the restoration of gospel of Jesus Christ. He gave a patriotic talk about America in Salt Lake City on July 4, 1854 in which he referred to Moroni as the “guardian angel of America.” Elder Hyde said, “That same angel of God that appeared to Joseph Smith presides over the destiny of the United States of America.” Elder Hyde said that Moroni was in the camp with George Washington and helped when he had trouble. He said that same angel was with Christopher Columbus and gave him deep impressions and dreams and visions respecting the new world. And according to Elder Glen L. Rudd in a BYUI Devotional, “that same angel was with Columbus on the stormy deep. He guided his frail vessel to the desired haven, and he calmed the troubled elements” (see The Angel Moroni by Elder Glen L. Rudd, BYU–Idaho Devotional – March 11, 2003). During Columbus’ fourth voyage to the Americas, he and his crew encountered many terrible storms, they had a failed attempt to establish a settlement in Central America, they had many battles and with the native inhabitants, and eventually became shipwrecked and stranded on the island of Jamaica. During this voyage, on 6 April 1503, Columbus had one of the seminal experiences of his life where he heard a celestial voice both chastise him and comfort him and buoy him up. “Christopher Columbus looked upon himself as a man of destiny who had been given a charismatic gift to understand Scripture, navigation, maps, winds, tides, astronomy, cosmography, mathematics and related sciences. His understanding of his mission, or enterprise, was drawn from the Bible or proved by the Bible, and he knew that he was opening up new lands rich with gold and other valuables. He believed himself a chosen person working for the good of all Christendom in opening up the rest of the world to the gospel message. He knew that he would be misunderstood and maligned, but he accepted that as the lot of a divinely chosen person” (Libro de las profecias, p. 105. Raccolta, pt. I, vol. ii, p. 79. Also see Columbus and the Hand of God by De Lamar Jensen, Emeritus professor of history at BYU, Ensign Magazine, October 1992). Samuel Eliot Morison, author of Admiral of the Ocean Sea, said this of Columbus. “[Columbus’] contemporary and friend, Las Casas, in an oft-quoted passage says he was as certain of finding what he said he would as if he had it already locked up in his trunk. Las Casas tells how “from all sides and in many ways did God give Columbus motives and causes that he should not doubt to undertake so great a deed,” and that “God seemed to move him on by constant pushes.” (Bartolome de las Casas, Historia de las Indias (Mexico City: Fondo de Cultura Economica, 1951), 27—34.) Everything else in Columbus’ life is subservient to the carrying out of that one mission. The aim and purpose of all his work and suffering was what happened at 2 A.M. on the morning of October 12, 1492, and must not be judged by what happened after (it was “the wrath of God upon the seed of my brethren,” says Nephi), or by any other quirks or misadventures. In retrospect we see that this is so—but Columbus himself always knew it was: God had chosen him to do this one great deed. “… Sailing into a perfect blank on the map, Columbus infallibly did the right thing: “He did not make a single false move in the entire voyage!” says the geographer Professor Nunn. He maintains that Columbus must have been the discoverer of the Trade and prevailing Westerly Winds since it was only by taking fullest advantage of both that his journey was possible—yet his subsequent voyages show that Columbus knew nothing about the wind system. (See George E. Nunn, The Geographical Conceptions of Columbus, New York: American Geographical Society, 1924.) This was not Columbus’ doing. Neither was the flight of birds that appeared just in time to keep the ships from turning back, nor the sudden rising of the sea that at another time inspired the expedition to continue. Call it what you will, Columbus was convinced he was being helped. Excellent report. Thanks for putting this together.